Monitor and analyze all of your Apache server logs with one tool. Don't just read your logs—deeply understand and interact with them. Easily sift thru your Apache Access and Error logs into easy, understandable visuals with deep, detailed analysis. Maximize your Apache HTTPD web server performance with real-time analytics and troubleshooting. Quickly discover all different types of visitors and any problematic requests from them. Improve user experience. Monitor all servers without having to log in to separate instances and see which assets your visitors are using in order to make informed decisions about your network. Monitor across disparate sets of Apache data and uncover hidden business opportunities and issues. 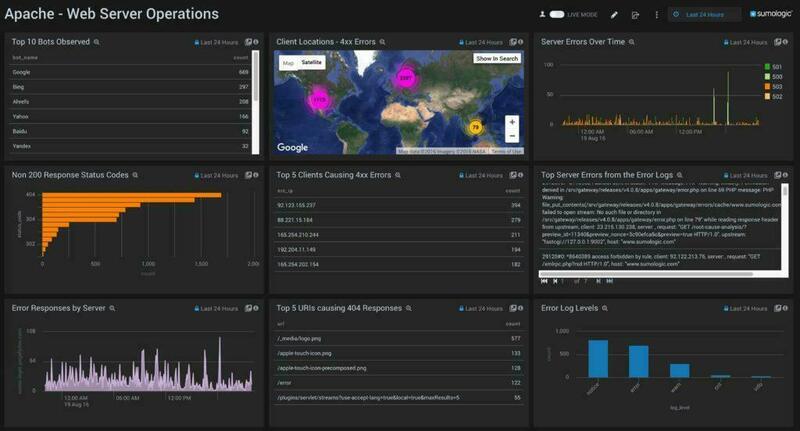 Trace customer sessions and behavior, correlate and find issues that span across your web servers and other parts of the application tier (e.g. databases, SANs). Investigate any visitor activity and drill down to the smallest activities in any time frame. Discover and resolve bottlenecks in your Apache HTTPD configuration. Investigate top geo locations of your visitors. Get insights to overall traffic patterns and distribution. Understand the volume of traffic being served, including the bytes that were served out. 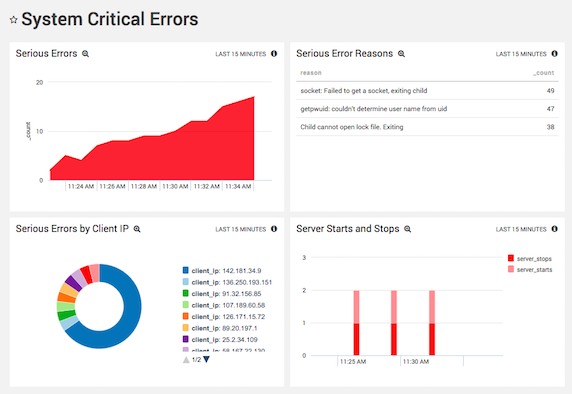 Set alerts for any specific IP or error requests, so you can take proactive action. How can Apache logs help you improve your security posture? Apache logs contain critical data on your users. The right analysis of your Apache logs can help you move from reactive to proactive. A new approach takes the power of big data and advanced analytics and applies them to end-user behavior. It detects anomalies (deviations from the established baseline) and flags exceptions in real-time to help you identify real and potential threats. The Sumo Logic App for Apache uses the default error log file format. Leverage Transaction Analytics to easily detect events in complex transactions. 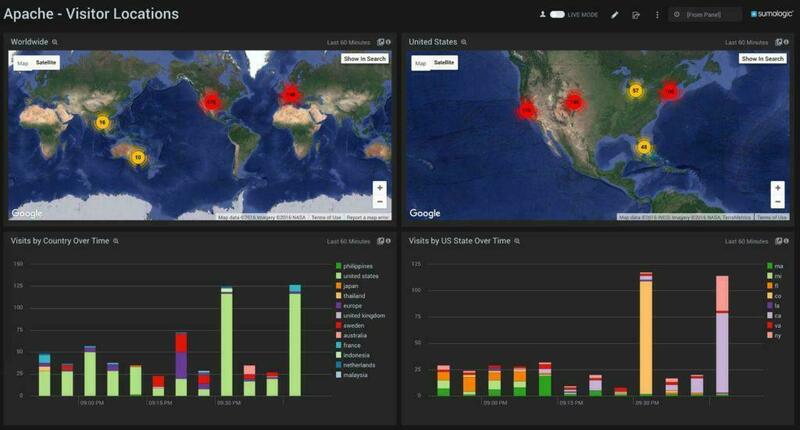 Visualize access log data to drill down into visitors demographics. Understand all the devices being used by your customers. Drill down on browsers and operating systems used by visitors to prioritize value-added features into your application for customers. Define future requirements and optimize experiences based on usage and geo location trends. Learn more about installation, collecting logs and setting up dashboards by visiting the Sumo Logic App for Apache documentation. Get your logs into one place: Sumo Logic provides lots of different ways to do this. The easiest is to use our setup wizard and follow the instructions to set up a collector and point to your logs. Jump-start your implementation: Getting started with log analysis can be difficult to do if you haven't done it before. 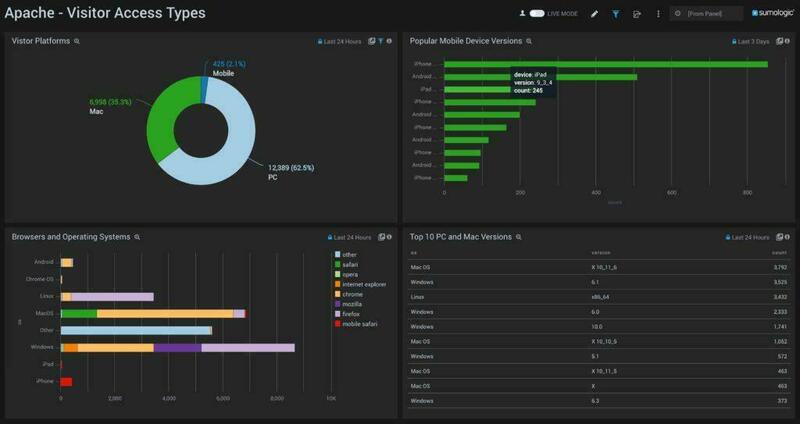 Sumo Logic provides an Apache application with built-in best practices that provides easy-to-use dashboards and sample searches to get you started quickly. Decide what is most important to you: You can't improve what you can't measure, and you can't measure it if you don't know what "it" is. Now that you have the data and you know how to extract value, look at the most important metrics for your business. Learn how to customize Sumo Logic for your Apache server environment in our documentation. To find issues that may require closer attention, explore the capabilities of a SaaS analytics service like Sumo Logic, which uncovers insights that are easily overlooked by the human eye and difficult to find via basic logging. 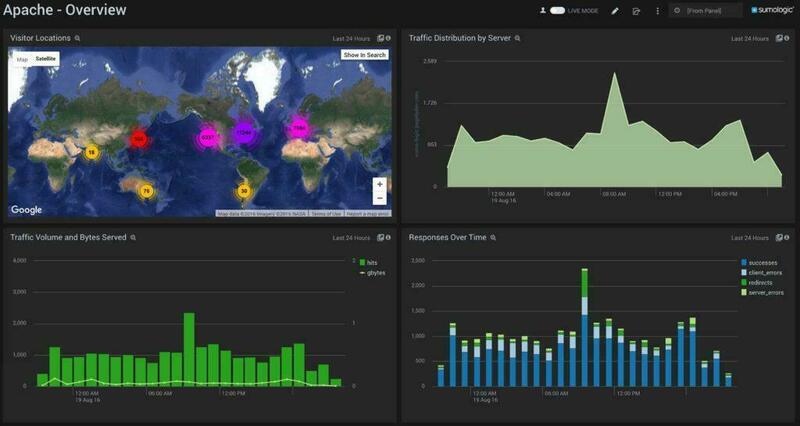 Sumo Logic offers a free service that allows you to analyze traffic by total volume and hits, total traffic by each server, and hits and volume by URL. Get a free 30-day trial of Sumo Logic Enterprise edition, customized to your team’s needs. Apache access logs can be configured to write log data in various formats, such as common log format, combined log format, multiple access logs, and conditional formatting. To learn more about the various access log formats, visit Apache Logs at Apache Project - Log Files. Sumo Logic has a built-in Apache access logs parser that can be applied to quickly analyze and visualize your logs without bothering to write regex to parse access logs. Apache error logs provide detailed operational data about the Apache web server, like start and stop of server, diagnostic information on issues with processing certain requests that are being sent over, and more. Using these logs, you can match error codes with corresponding requests.